RoseAnn Dalmas began volunteering for the faith-based youth organization Pathfinders when her son was just 10 years old. Dalmas, of Fairfield, CA, continues in the volunteer role of director for that organization some 25 years later. Today, though, she has a new job serving older adults, partly as a result of this volunteer role. For years, volunteering has filled an important need for Dalmas. Her Pathfinders work has helped the mother of three grown children and one grandchild serve her community. “I just feel energized when I can help someone have a better day or bring a smile to someone’s face for whatever reason,” she explained, in describing the benefits of volunteerism. “It gives me an inside energy. People tell me they don’t know how I do it and that it must be keeping me young. I feel like I’m in good health and I’m rarely sick. I’m not a sit-around kind of person. I like keeping busy with one activity or another,” she noted, like the hand-stamped greeting cards she makes as a hobby and distributes free at her church. 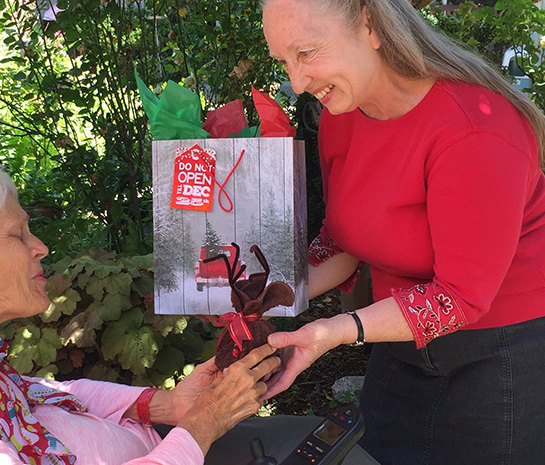 For the past 12 years, one of the Pathfinder projects has been the Home Instead Senior Care® network’s Be a Santa to a Senior® program, a holiday campaign that provides gifts to older adults who might not receive anything during the holidays. Dalmas spotted information about the program and thought it would be a great fit for her youth group. 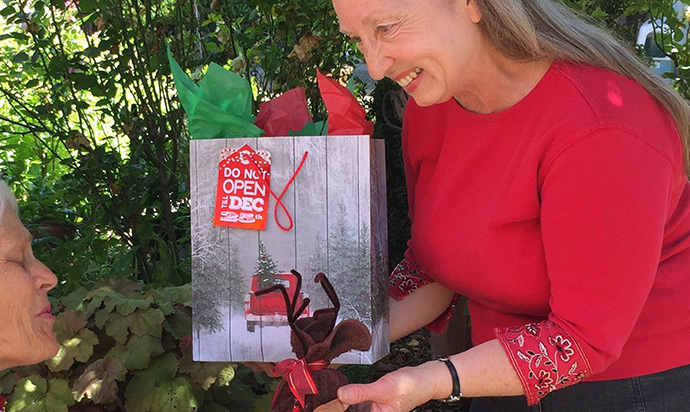 When Dalmas was looking for a job after 30 years out of the workforce, she thought about the possibilities of a CAREGiver℠ position with Home Instead Senior Care, the Be a Santa to a Senior program sponsor. “I thought it was something I could do. My grandmother raised me – I called her ‘Mom.’ She had lost her leg at 21 so I never knew her not to be disabled. At some point, she would need extra things so I grew up as a caregiver. She was able to do less and less until she could no longer be cared for at home.” Dalmas, who also has experience helping her father-in-law and other older family members, never dreamed there was a company where she could work as a caregiver until she learned about Home Instead Senior Care. When it comes to returning to work, nearly a quarter of survey respondents (24 percent) said they chose volunteerism as a way of returning to working, while 11 percent entered retail and 8 percent entered the health field, acting as a caregiver, a part-time nurse, etc. One of the only common themes running through the choice of a new career was the importance of making a positive difference in the lives of others, where 78 percent of respondents said that it was either somewhat or very important to them to make a positive impact on the lives of others in unretirement. Twenty-two percent of respondents said they chose to return to work after retirement because they had the opportunity to do work they considered meaningful, like caregiving, teaching or generally giving back. What’s more, Dalmas’ experience as a volunteer not only led her to a new career as a CAREGiver, but continues to generate feelings of fulfillment. Her sentiments are common among older workers and volunteers, experts say. “It feels good to do good,” said Marci Alboher, Vice President of Strategic Communications for Encore. “According to a VolunteerMatch survey of older adults, 75 percent of those who volunteered in the last 12 months said volunteering made them feel physically healthier. UnRetire Yourself℠ is a public education program brought to you by Home Instead Senior Care®. The franchised businesses in the Home Instead Senior Care network are some of the world’s largest employers of older workers. Find an unretirement opportunity in your area.